At least two of these gauges - 1000mm and 1676mm (5 ft. 8 in.) 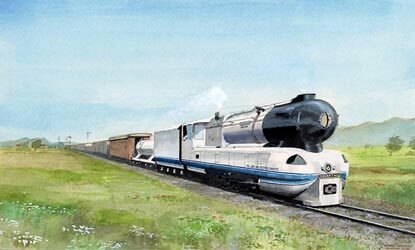 once had streamliners running on them. In 1934, Buenos Aires Western Railway received one British-built diesel electric 48-seat railbus, powered by an Armstrong-Saurer 6BXD 122hp engine. The body was built by Park Royal Vehicles Ltd, London and delivered to Scotswood for fitting. It had a cab at each end and accommodated 48 passengers. 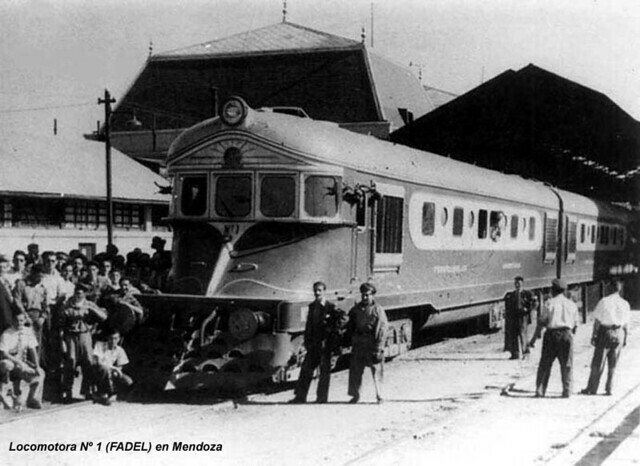 In 1937, a batch of single & double railcars, powered by Armstrong-Sulzer 6LF19 275hp engines arrived to Central Argentine Railway. 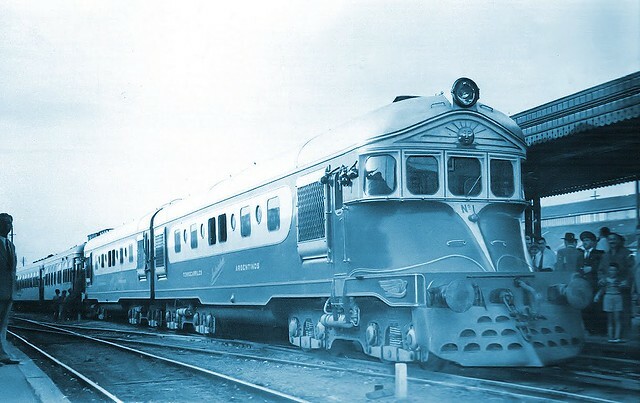 From 1937 through eraly 1960s, diesel multiple units built by Ganz (Hungary) were used for Buenos Aires Great Southern Railway express service. 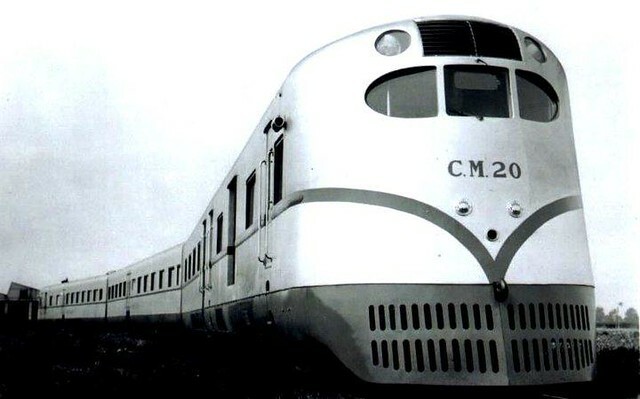 There were two DMU classes; similar in appearance, they had different dimensions. One, so-called "Ganz Catamarca", served on the Catamarca route, metre gauge. 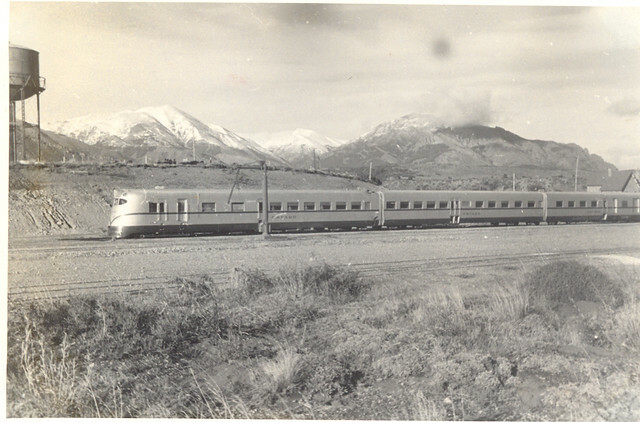 The other, "Ganz Bariloche", was used on 800km Viedma - San Calos de Bariloche route, 1676mm 'Indian' gauge. Several months ago I wrote that Argentine Ganz DMUs could be inspired by the Chilean Railways Southern Arrows. Now, knowing when the production started, I can say just the opposite - the Arrows were built later. 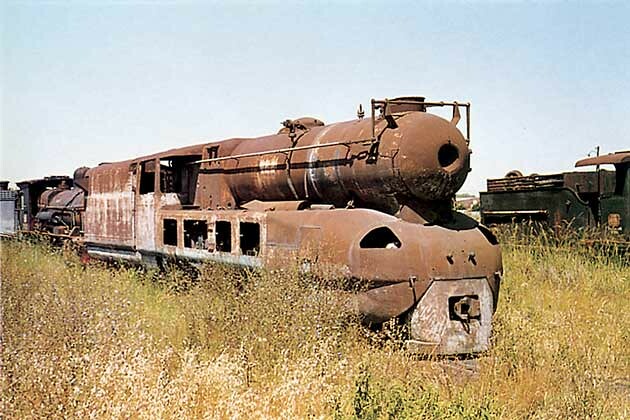 And don't forget that "Ganz Bariloches" were practically identical to the Soviet DP-1/10 diesel trains received from Hungary as war reparations. Finally, after 1939 railway nationalization, came a domestic-built... not exactly a streamliner but a remarkable diesel electric locomotive: No. 1 Justicialista. She was powered by two 735hp Sulzer diesel engines. Top speed was 90 km/h. This heavily ornamented machine, built in 1951-1952, seems like a guest from some parallel world. Maybe from Warhammer 40K. 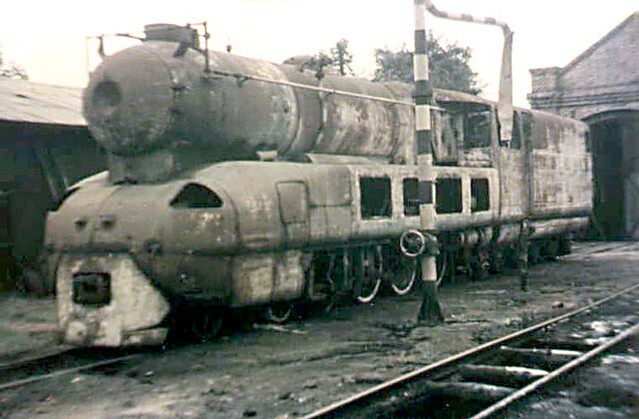 In reality, Justicialista and her sister La Argentina (later renamed Libertad and Roca) were just a start of an ambitious project, not less than 600 locos fitted with more powerful Italian diesels. The project was abandoned after 1955 coup - new government didn't want to invest in "Peron follies". Inorder to carry out the rebuilding No.2011 was transferred to Ing. Livio Dante Porta & Co. Ltd.’s workshops at Puerto de Rosario (Port of Rosario), Santa Fe province, in 1948. The rebuilding transformed the locomotive into a 4 cylinder compound 4-8-0 locomotive with a twin axle bogie tender. The locomotive was arranged with the 2 high pressure cylinders, 360mm diameter by 660mm stroke, (approximately 14¼” x 26”) between the frames and 2 low pressure cylinders, 580mm diameter by 560mm stroke, (approximately 23” x 22”) outside the frames. Construction costs were lower than for any locomotive of equivalent power despite ‘Argentina’ being experimental. This can largely be attributed to the extensive use of welded mild steel plate in many areas such as the pistons, cylinders, streamlined casing, tender tank extension on top of the original tender and axleboxes. 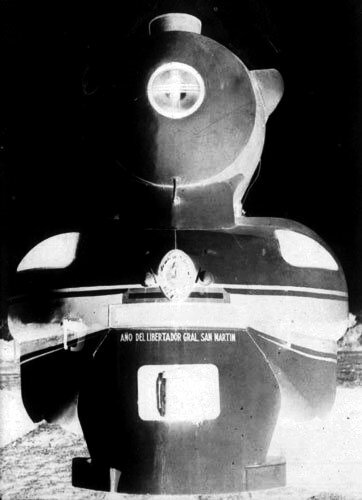 When outshopped 'Argentina' the nameplate 'Argentina' was carried at the front of the locomotive. 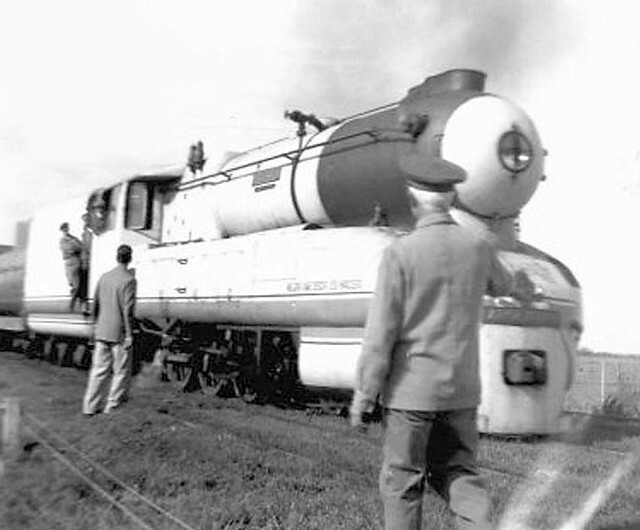 On the boiler sides the locomotive bore the name 'Presidente Perón'. 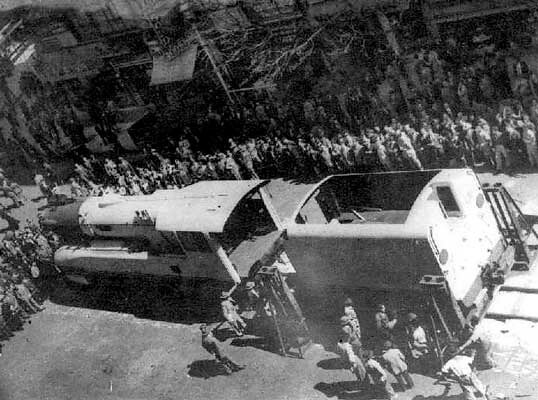 The locomotive also bore two inscriptions which quoted the words of Perón. These were painted onto the casing in the area adjacent to the cylinders. On the right hand side (right being when stood in the cab facing the smokebox) the inscription was: "Mejor que decir es hacer" - "Better to do than to say". And on the left hand side: "Mejor que prometer es realizar" - "Better to carry out than to promise". 'Argentina' was painted in the colours of the Argentine flag - white and sky blue. Unusually for a steam locomotive the bulk of the machine was painted white with one broad blue band and two narrower ones low down on each side. 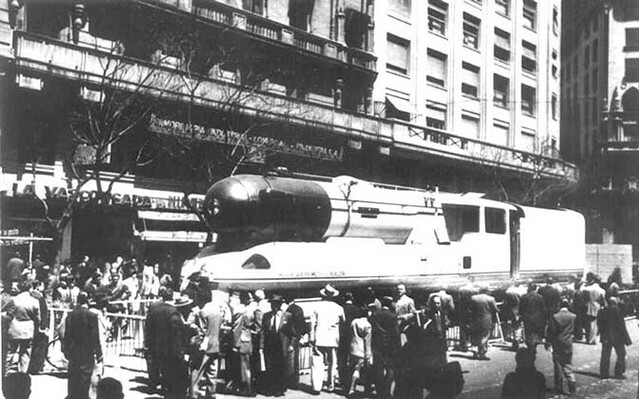 Having arrived at La Plata she was subjected to a month of tests and various trials prior to the intended start of a series production. During this period she was based at the Porta's railway workshops at Gambier, a suburb of La Plata. Present for the many record breaking tests was the renowned French locomotive engineer, and friend of Porta, André Chapelon. Her smaller dimensions, lower weight and greater efficiency than other locomotives of the same horsepower meant she was able undertake very similar duties. It also meant repairs could be carried out in smaller workshops, whilst the axle loading avoided the need to increase the strength of the permanent way. Only good things are said about the locomotive and its abilities. It is reported that on several occasions Porta had fierce arguments with the railway authorities over the locomotive's ability to haul trains which were considered to be vastly too heavy. This led to Porta finally arranging for the locomotive to be heavily "overloaded" to prove his point, which of course he and 'Argentina' did. On another occasion, with a skeptical footplate inspector on board, he stopped the locomotive on a gradient so steep it was deemed impossible to start from made worse, again, by the locomotive being "overloaded" according to said inspector. 'Argentina' restarted the train with no problems and the inspector was left somewhat "red faced"! 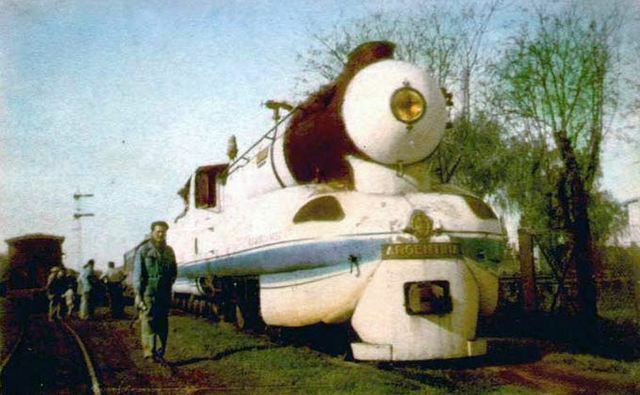 In 2000 Porta decided to try and return the locomotive to the Buenos Aires area with a view to returning the locomotive to service. Even today it would be a fine demonstrator of what is possible. Porta was keen to not just ‘restore’ the locomotive but wished to incorporate modifications based on his experience since 1949. (Unquote) Thank you, Mr. Bane! Since 2004, there are no new photos of Porta's masterpiece. Who will cry for this Argentine beauty?.. Yes of course. 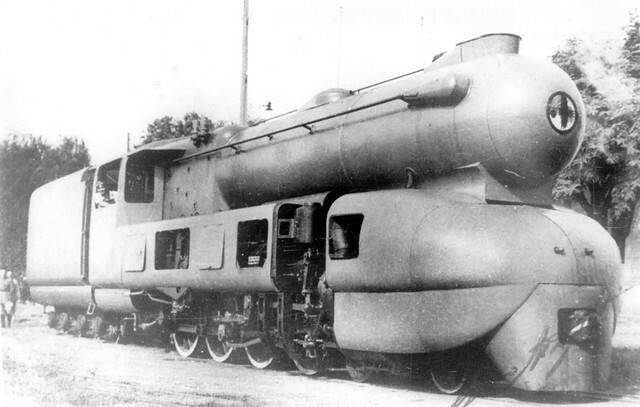 We have a separate article on the Soviet Ganz trains. Wonderful as ever,your work here is looked at often by myself and i must say its much appreciated as well.